Disclaimer: I was a guest of Coopers Brewery at the launch lunch, and arrived home from it to find 6 bottles of the 2012 vintage for me to cellar. If someone asks you if you want to go to the launch lunch for Coopers 2012 Vintage Ale you sort out any necessary babysitting in double quick time and say “yes please!”. Or at least, you do if you’re me! As you’ll know, I’m a big fan of Coopers Celebration Ale, and I’m also extremely proud of the fact that a South Australian brewery is Australia’s largest Australian owned. So it’s really somewhat remiss of me never to have tried Coopers Vintage Ale. The launch was held at the Coopers Alehouse at the Earl of Aberdeen and the event kicked off with plenty of the aforementioned Celebration Ale. After photographs for the social pages we moved through to the dining room, ready to eat our lunch which was matched with both the current and back vintages of the ale. We started with crumbed lamb cutlets, matched with the 2011 vintage. We followed this with roast barron of beef. This was a monstrous piece of meat and I was really impressed how well it was cooked. Considering the kitchen was catering for a packed restaurant, I thought that serving individual pieces of meat was a really brave move. My piece, despite being big enough to feed a small army, was cooked medium rare and was perfectly tender and juicy. All around me, the pieces of meat were reasonably consistently cooked and were all greeted with oohs and aahs about both the size of the portion and the tastiness of the meat. If there was any space (I’d saved some by skipping vegetables) we wrapped up with cheese paired with the 2007 Vintage Ale. I’m sorry to tell you that this isn’t available retail but it was a great opportunity to taste a matured beer. It was amazing to see the development of the ale: the 2007 had a remarkably fortified flavour. A sort of cross between Port and an Australian fortified muscat or tokay. This worked brilliantly with the cheese and dried fruit but I also think a formidable combination would have been the beer with a dense, rich chocolate torte. It was fascinating to chat to various members of the Coopers team. Something I’ve never really thought about is how it’s so important for beer production to be consistent but, of course, it is. No one wants to buy a beer one day that has the same name but tastes completely different from the one you had last week or last month. Beer drinkers are typically loyal, so variation is noticed immediately. 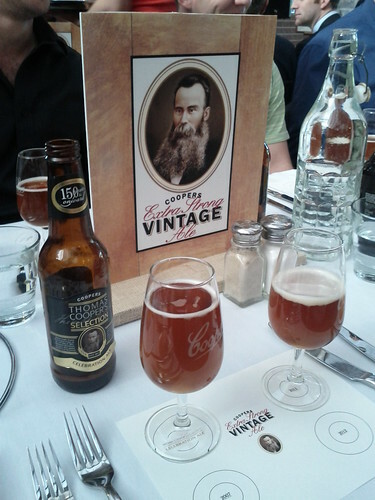 Coopers Vintage Ale provides the brewers with an opportunity to play around and experiment. The first vintage ale (in 1998) was brewed lager style: a clear, filtered beer. In 1999 Coopers headed back to secondary fermentation (like Pale and Sparkling) and since then the formula has been tweaked every year, with variations in hops and malt. This year the beer contains five different hops: Perle and Magnum (from Germany), Nelson Sauvin (New Zealand) and Centennial and Cascade (US). Coopers has also made use of crystal malt barley from Clare and the Yorke Peninsula.